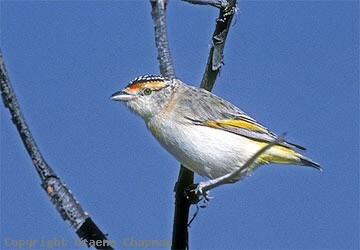 The Red-browed Pardalote is essentially an inland species although in northern Australia it can be found in drier regions closer to the coast. 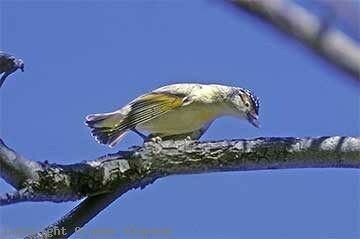 The closest relative to the Red-browed Pardalote is the Spotted Pardalote which is widespread throughout temperate southern Australia (best clue are the spots on the crown of both species) . 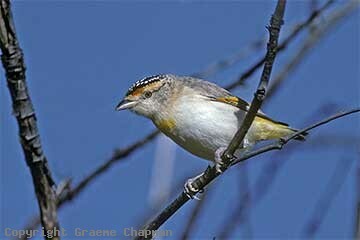 Unlike the Spotted Pardalote in which the sexes differ (yellow spots on crown of female, white in male), in the Red-browed Pardalote, the sexes are alike. 570202 ... 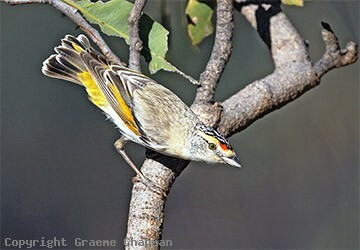 Male displaying to female.